Mississippi has a new law which fully legalizes discrimination. Although this law is a bit redundant, since people who are LGBTQ already have zero protections in Mississippi, this "religious freedom" law is an example of the types of bills being written and laws being passed in other states as well. I’m sure you heard the controversy over North Carolina’s HB2 law requiring transgender guests to use the restroom based on the gender on their birth certificate. Although this law was repealed and replaced with a new, "improved" law HB12, the new law remains similarly discriminatory towards transgender people. Folks who are transgender may or may not choose to transition. The process of transitioning from male to female or female to male is purely optional. It's also expensive, time consuming and there are many trans people who do not have the resources to medically transition. Some trans folks might identify as non-binary and have no intention of going on hormones or undergoing any other procedures for transition. For these folks who are not planning to medically transition and legally update their gender marker, these discriminatory bills and laws may be particularly scary. Essentially, these laws require someone to use the restroom of the gender on their birth certificate, regardless of whether or not that is how they currently identify. With laws like this increasingly acceptable, it's important for companies to step up and provide protections for transgender employees and guests. 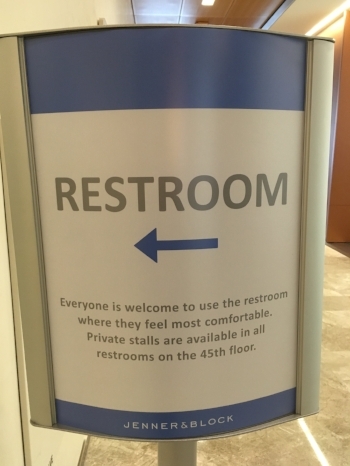 Does your company have an inclusive restroom policy? Has your company made arrangements to ensure that your transgender guests and associates can feel safe? Policy changes that relate to updating forms in your business can be the most effective way to ensure that your transgender and non-binary guests are treated with respect. For example, if your business is a spa, consider updating the registration form that a new guest completes. Request gender and provide an open-ended option like 'Other'. Ask for honorific/title, and consider using gender-neutral honorifics. Other companies like airlines and banks may also request a preferred name, in addition to the legal name on the account. When you give your guests the opportunity to self-identify, your workers can then refer to that information rather than making assumptions. Whether your company is a bank, airline, spa, fitness center or other facility, creating policies that allow your customers to self-identify is an important best practice. Not only does it send a signal to your customers that your company is paying attention to the diversity of its community, but it also represents a powerful step towards inclusion, especially given that 12% of Americans 18 -34 are identifying as transgender. In our survey of transgender customers, one of the most consistent pieces of advice from them to businesses, was simply, "don’t assume." Virtually every trans person we spoke to would rather be asked clarifying questions in a respectful, pleasant way, rather than someone making an assumption about their gender identity or gender expression. Of course, those clarifying questions can be awkward when asked verbally, especially to a novice associate. When your company puts those questions in a form, it creates a win-win for everybody. Your customer feel seen and your employees can feel confident in their customer service.